A Schengen visa is a document issued by a corresponding authority, which allows its holder to travel to a signatory of the Schengen Agreement or to the Schengen Area. The Schengen Area comprises 26 member countries, out of which 22 are the EU members. Countries like Norway, Iceland, Switzerland and Lichtenstein are not EU members, but they have joined the Schengen Agreement and honor the free movement policy within the Schengen Area. A Schengen visa is issued in the form of a sticker affixed on the passport and its appearance is the same for all the countries within the Schengen Area. There are several Schengen visa types. 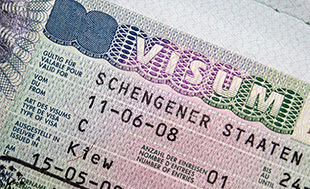 The validity of the Schengen visa depends of the purpose of the travel. The Schengen Visa was introduced to make travelling faster and easier between all the EU countries that signed up for the agreement. Once a Schengen member country has issued a visa, the holder of that visa can move freely between member countries. This avoids the need to apply for multiple visas, reducing cost and paperwork. If you are planning to travel to any of the Schengen countries and you are not the resident of a country which is party to the Schengen Agreement, you may require a Schengen visa. You will need this visa if your travel for pleasure, plan to visit your family or friends or go on a business trip to any of the Schengen countries and intend to stay less than three months. Therefore, if you are not a citizen of one of the countries in the Schengen Area, you should apply for a Schengen visa. What are the advantages of the European Schengen visa? in case of visiting several countries within the Schengen Area, you will need only one visa for the whole travel. Which European Country Has the Lowest Unemployment Rate? This form can be filled in by hand or by typing into it. Don’t forget to sign it. Your signature has to be the same as the one in your passport. Fill in all the required fields carefully. Don’t use coloured pencils. Use black or blue pen. Arrange this appointment on time, you never know how long it will take to obtain the visa. Have in mind that you have to hand personally the required documents. The Schengen agreement is a treaty which led to the creation of Europe's Schengen Area, in which internal border checks have largely been abolished. Originally, the concept of free movement was to enable the European working population to freely travel and settle in any EU State. The Schengen treaties and the rules adopted under them operated independently from the European Union. Schengen is now a core part of EU law - in May 1999 “The Treaty of Amsterdam” incorporated the agreement inside the legal framework of the European Union. France and Germany are the two pioneering countries to take initial step as regards of free movement concept, these two countries on 17 June 1984 were the first ones to bring out the abovementioned topic within the framework of the European Council in Fontainebleau where they all approved the need to define required conditions for the free movement of citizens.